How to DIY Beach Cottage Mudroom? Is there a space in your home that you need to function properly? For me, this is a mudroom. That’s why I rely on a entryway or mudroom to organize all of our junk. 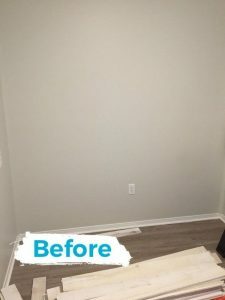 After we moved to our new house I knew my first project needed to be project mudroom! AS ALWAYS, I NEEDED TO CREATE IT ON A BUDGET. SO WHEN I WAS WALKING THROUGH WALMART AND SAW A $59 SHELF THAT I COULD REPURPOSE AS A BENCH, THAT’S WHEN I KNEW I HAD MY MUDROOM PLAN. How to DIY Nightstands on a Budget? © 2019 I Love My Green Planet. All Rights Reserved.